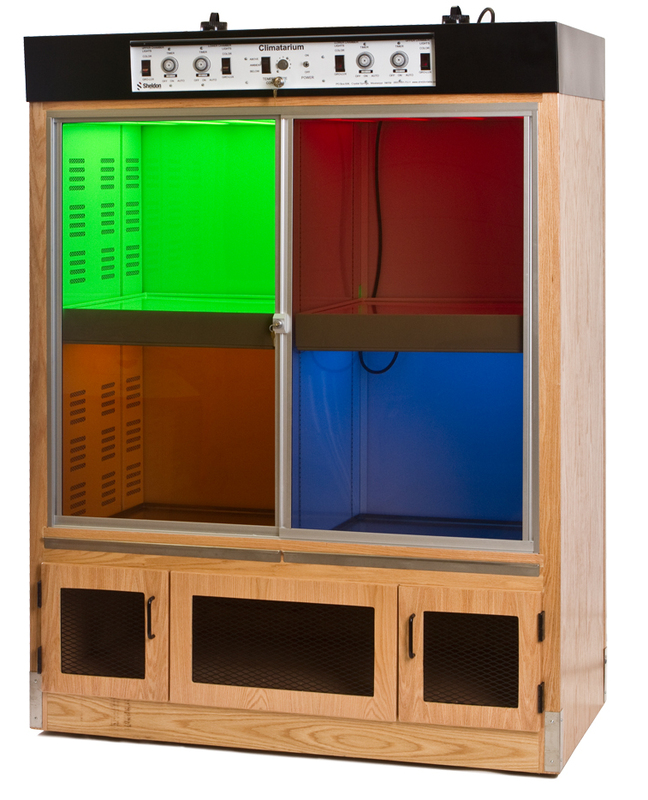 Temperature, light and ventilation controls make the Climatarium II adaptable to any classroom setting. Seasons, weather and light can be simulated based on the project. The Climatarium II offers an opportunity to explore the behavior of plant life like never before. 56″ L. X 27″ W. X 74″ H. Overall. Consisting of interior top, back and ends with white acid-resistant surfaces; ends perforated to ensure even air circulation regardless of shelf location; two (2) water-tight stainless steel pull-out debris trays. Two (2) sliding doors with tinted Lexan panels; instrument panel with lockable panel cover. Lower compartment divided into three (3) compartments, each end compartment with one (1) hinged door. Switches on instrument panel control master circuit breaker switch, lighting, blower, and temperature. Four (4) photo-period programming timers permit setting for each 20-minute interval of light for each 24-hour cycle; superstructure fitted with two (2) light banks, each light bank with four (4) Gro-lux lamps and four (4) visible range lamps, each switched to control series on-off positions; two (2) adjustable water-tight steel light/plant trays, each tray on underside fitted with four (4) Gro-lux lamps and (4) visible range lamps, each switched to control series on-off positions; visible range lamps are to be red, blue, green and yellow.